First comes love. Then comes…the engagement party. What, you didn’t think it was marriage already, did you? 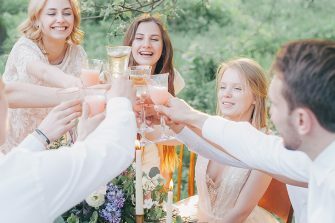 One of the best things to look forward to as an engaged couple is the engagement party, and no matter how many you may have attended at this point, you might have some questions concerning etiquette. Who do you invite? What do you wear? When should it happen? Girl, relax. With so much on your plate, we wanted to make it easy for you to be perfectly poised at your celebration, so we’re explaining the top seven things to keep in mind when it comes to engagement party etiquette. Sending your invites is, without a doubt, one of the most important things to accomplish early. Invitations can be printed on fancy cardstock and formally mailed, or if you’re planning a more casual affair, Evites and/or phone calls will suffice so long as everyone knows when and where to gather. 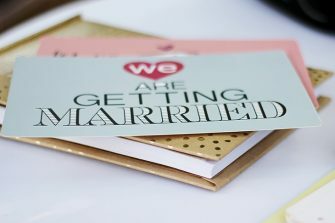 Invitations should be delivered when the engagement is still fresh, anywhere from a week to three months after the accepted proposal. Besides the standard date, time, and location, you’ll want to include the attire, who is hosting, and how to RSVP. Believe it or not, this is a great question. 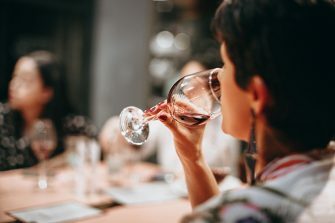 Typically a more intimate affair than weddings, engagement parties have only one hard rule when it comes to your guest list. Ready for it? Everyone invited to your engagement party must also be invited to your wedding. 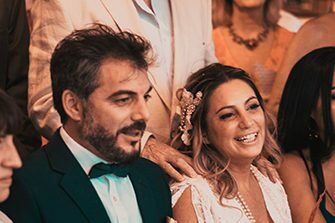 Of course, the exception to the rule would be if you’re having a destination wedding in which it may be less than reasonable to expect 100+ friends and relatives to board a plane to Bora Bora. In this instance, your engagement party guest list may outnumber your wedding guest list. As the bride-to-be, your parents would traditionally host the party; oftentimes in their home or an accommodating venue such as a restaurant or a fanciful garden. There are many options for renting at-home party necessities such as tents, tables, chairs, linens, and dinnerware to transform your space into a comfortable and elegant event. 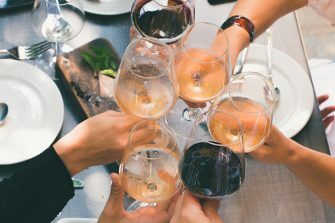 In these modern times, however, anyone close to you and your fiancé can host the engagement party, be it a sibling, friend, or even yourselves. Attire will be an obvious indicator of how formal or informal your event is, which is why you should specify what to wear on your invitation. As the woman of the hour, you may be wondering what you should wear. The answer: whatever you please. Although it’s customary to wear white, you may feel more comfortable in a colored or printed dress. Whatever color you choose, do dress up for the occasion. Engagement parties are not necessarily a gift-giving event. That being said, some people will insist on bringing a gift. 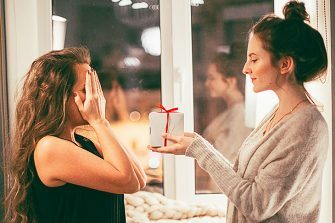 If a guest comes bearing a gift, simply thank them and discreetly set the gift out of sight so other guests don’t feel guilty for not bringing anything. Be sure to write them a really nice thank-you note later. We should clarify. Engagement parties are not an event where the engaged couple should expect to receive gifts. But, if you aren’t the ones hosting the party, you’ll want to be sure to show your appreciation to your host and/or hostess for throwing you this special get together. Thank them with a gift such as concert tickets, a vintage bottle of wine, or anything else they might enjoy. A party isn’t a party without food of some sort. Unlike your wedding, an engagement party does not require you to host a sit-down dinner with cake and toasts and all that pomp and circumstance. Of course, you’re more than welcome to have those things if you want. After all, it is your party. 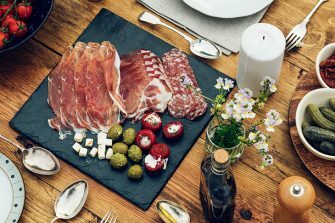 Engagement parties on the formal end of the spectrum may have a sit-down dinner, dessert, as well as hors d’oeuvres and a signature cocktail. It’s also a great opportunity for you to audition your caterer and other vendors! More casual celebrations may have a buffet or a taco bar, appetizers, and who says you can’t still have a signature cocktail? If you’re having a traditional engagement party where your parents are hosting, your father would rise first and toast you and your fiancé. Following that, your fiancé would then stand and give a toast, complimenting you (his future wife) thanking your parents for the party, and then saying something sweet about his own parents. At a non-traditional party, however, anyone is invited to speak, and as the couple of the evening, always always always say something before the end of the event. After all, everyone came together to congratulate you! That’s worth a toast, wouldn’t you say? Consider these seven tips your quick guide for becoming a perfectly poised, well-mannered bride-to-be. Your guests – and your fiancé – will be so impressed with your etiquette! 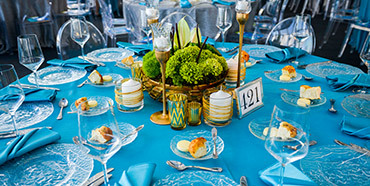 If you’d like to try us out as your rental company, contact Well Dressed Tables!